Race other rookies and hone your poker skills in the weekly Beginners Races on Titan Poker. Generate 100 raked hands or more for cash prizes. Are you new at Titan Poker? Boost your bankroll with Races for beginners every week. All Titan Poker players who have signed up in the last 90 days are eligible for these races. Generate raked hands each week at poker beginners cash tables. The higher the number of raked hands = the bigger the cash prizes you stand to win! Beginners cash tables can be found in the software under Special Offers >> Beginners Races Tables. Beginners Races run every week! You have from Monday through Saturday to generate as many raked hands as possible. 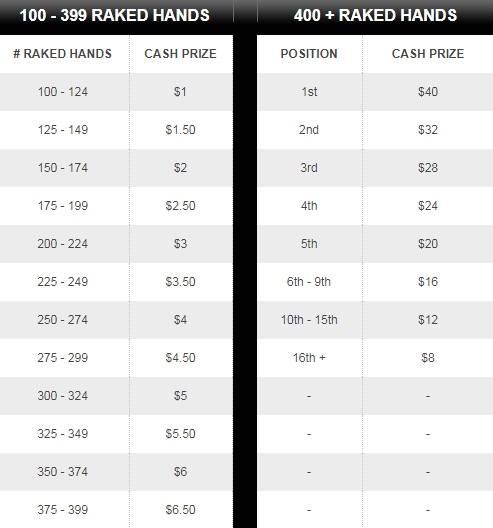 If you generate 100+ raked hands you can win cash prizes of up to $40. And that’s not all! Check all the benefits that YourPokerCash brings for Titan players. partypoker has implemented further changes to its daily Power Series schedule. Every day you can now enjoy BIG Bounty Hunters. Tournaments that carry boosted guarantees of up to $200,000 will start every day at 7 pm CET. 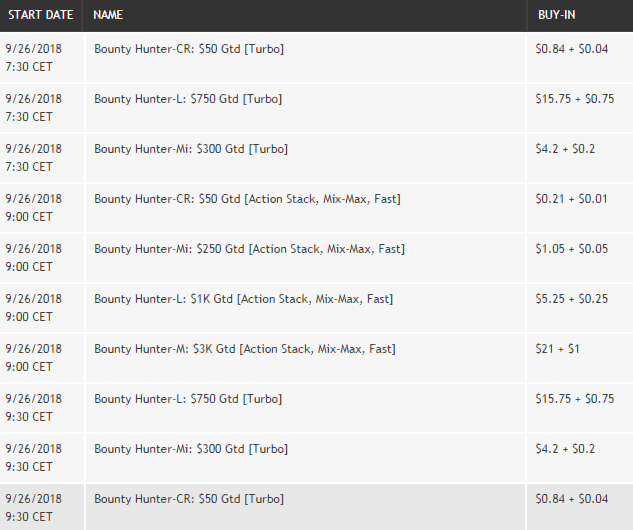 The new Big Bounty Hunter buy-ins range from $0.22 to $530 and are all ‘Progressive Knockout’ (PKO) format. The headline tournament in the new range is the daily $22 buy-in $50,000 GTD Big Bounty Hunter. This Sunday, 30 September the $22 BIG Bounty Hunter will carry a huge $200,000 guarantee. partypoker continues to waive the rake on the bounty element of PKO buy-ins. This means even greater value for players every day in these popular events. More tournaments, less rake, why to play anywhere else? Click here to check the whole Power Series, which brings $7M in guarantees every week. 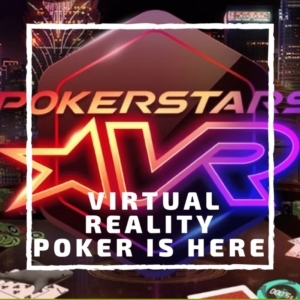 This week PokerStars announces its plan for another innovation – Virtual Reality poker game. They call it PokerStars VR. The official launch will be later this year, for now, we have just some hints from Pokerstars. Check out if you’re gonna like it. The first thing to note is that it’s free to play. It’s also authentic (that means it looks great). It’s immersive, and it’s social. Once you put on the headset, you enter a visually stunning game environment. Nothing is real, and yet you can still handle chips and cards just as in the real world. And while opponents might be playing from the other side of the world, but you can study them for any tells they might have and even chat in real time. What can you expect from this virtual world? It’s the type of game you can immerse yourself in. Almost literally. We don’t just mean in the exotic virtual reality settings (think Macau 2050 or a Monte Carlo yacht) but with statistics. All the numbers, as well as observations about other players, are all available to you because it’s still all about the poker. And as you might expect in this level of the virtual world, it’s not all about behaving yourself. So yes, you can throw food at people, smoke a cigar, or even own a pet donkey if that’s your thing. Or you could be more civilized and share food, order drinks, even stream shows or sport. Right now, the multiplayer no-limit hold’em game is in a “closed beta”. As you’d expect, a game like this needs intensive testing, which is why we recruited 100 hand-picked volunteers to put it through every scenario. As we speak they’re plugged in on platforms like Oculus Rift, HTC Vive, and Steam. What with the headsets, we can’t see the look in their eyes. But the smiles on their faces tell us what we need to know. Once their work is done the commercial launch will follow before the end of this year. Looks like that online poker will get a whole new dimension with Pokerstars VR. We hope that this will increase the popularity of this game and that it will bring more players to the tables. If you don’t have a PokerStars account yet, sign up with us, grab 100% up to 600$ welcome bonus and be ready for the virtual reality. The biggest Powerfest ever came to an end! All we can say that these 3 weeks on partypoker were incredible for MTT lovers. Across the 670 events, there was $69,106,263 in prize pools, which is for slightly over $9M more than it was guaranteed. Total prize pool on the last day of the event was incredible $6.816.872! 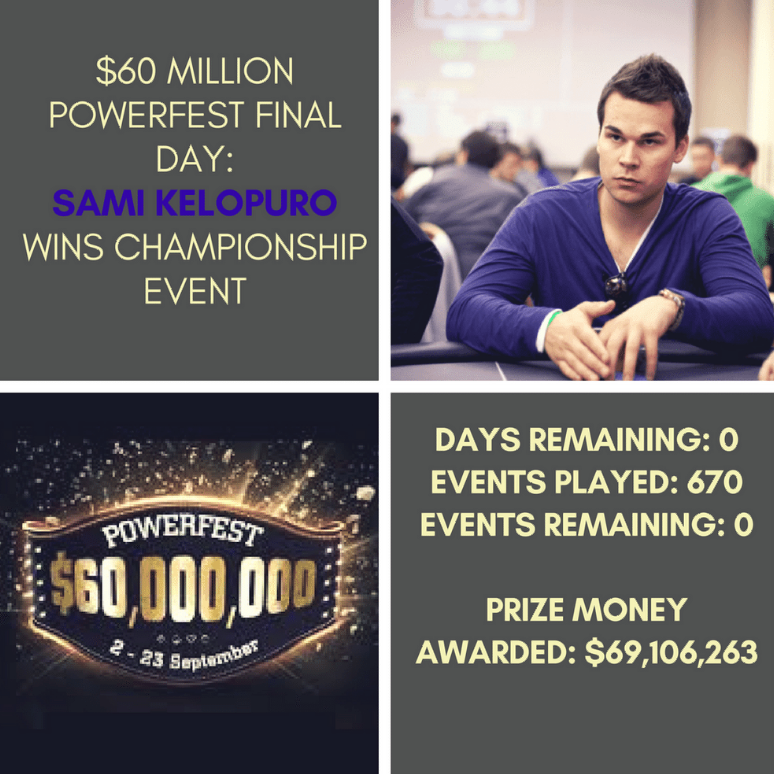 Official Championship Winner is Sami “LarsLuzak1” Kelopuro who won a $5,200 POWERFEST #142-SHR: $1M Gtd Championship Event for the $317,190 first-place prize. This successful event is just a proof that partypoker is doing a really great stuff lately to attract their players. Not only some big-named partypoker ambassadors are now promoting the room. You can see some greatest players int he world playing regularly on this site. Check out Final Day Highlights here. You still don’t have a partypoker account? It’s about time to join it and enjoy more events like this, which are about to come. 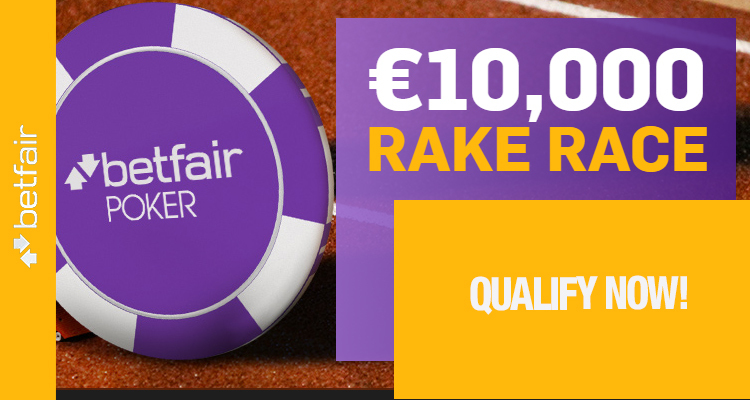 This month we’re giving away €10k in Betfair Rake Race. Top 20 players will split €9,000. The remaining €1,000 goes to an all-in freeroll that the top 50 players will qualify for. All you need to do is play any form of Poker. For every €1 of rake or fee, you’ll receive 25 status points. The more points you earn the higher up the leaderboard you go and if you finish top you’ll win €2,000 in cash! Receive 200% up to €1000 first deposit bonus at Betfair. The bonus is released in €10 increments for every 1,250 Status Points earned. You have 45 days from your first deposit to redeem your full deposit bonus. You will also automatically get a €10 Casino Games. Not to mention, €5 Twister Entry to €5,000 Jackpot Prize and €10 in Tournament Tokens for Betfair Live Events. Finally, signing up to Betfair poker through YourPokerCash will automatically opt you in to receive 55% rakeback based on weighted contribution each month. Betfair pays your Monthly rakeback of 55% to your player account. By the 5th of the month for previous months rake. Above all, play as many Twister Poker games each week for your chance to win a share of €12,500. The leaderboard resets every Monday and you will earn €1,000 prize if you finish top. The higher value twister game the more points you can earn. For more details check out our site. 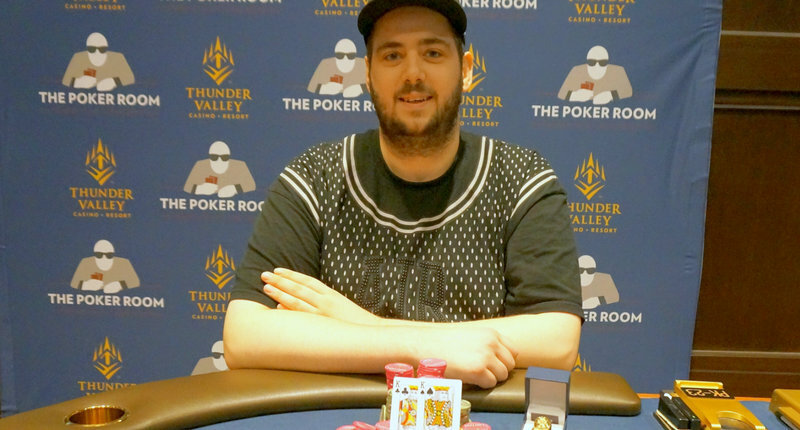 Brett Murray won WSOP Circuit Thunder Valley for $151.145 and the third gold ring in his career. He beat the field of 464 players. 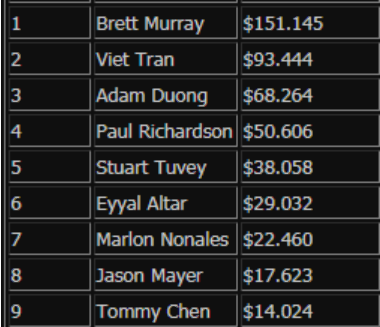 The guaranteed prize pool was $500.000 but the final prize pool was $702.960 for this $1.700 event. Winning this tournament, Brett Murray made his best result of career. Before this title, his biggest win was $135.980 which he took when he finished as 2nd in California State Poker Championship. Overall, he earned $1.032.864 in tournaments winnings so far. Brett reached the final day as a chip leader. There were 9 players at the beginning of the day. At the very beginning of the day, he took 2 knockouts and kept his chip lead. When there were 3 players left, he still had the biggest stack. Brett knocked out Adam Doung at the 3rd place and reached the Heads Up with Viet Tran. In the final hand Viet went all-in with 10 7 on the flop J 8 3 , Brett called with K K . The turn card was 5 and the river brought Q . Want to boost your bankroll? Don’t miss YourPokerCash exclusive Unibet Freeroll Series! Tournaments will take place on 10 next Wednesdays at 8pm CET. To be exact, on Sep 26th, Oct 3rd, Oct 10th, Oct 17th, Oct 24th, Oct 31st, Nov 7th, Nov 14th, Nov 21st, and Nov 28th. The Prize Pool for each freeroll will be €250. You can find tournaments in the lobby 7 days before the tournaments starts under the name: “Unibet Bankroll Booster Freeroll”. Registration opens 2 hours before the freeroll starts. If you have your Unibet account with YourPokerCash, contact us via mail with subject “UNIBET FREEROLL PASSWORD REQUEST”. If you don’t have an account with us, but you would like to participate in these freerolls, send us an email with the subject: “UNIBET RETAG” and in mail send us your Unibet screen name, we will check if you are eligible for retagging, and we will let you know in next 2 business days. Don’t forget about other benefits Unibet offers. New players should check for Unibet Welcome package, and all other promotions you can find on our site in the full offer revew. Are you new at Titan Poker? Make your first deposit and enjoy $12.000 New Depositor Token Package. 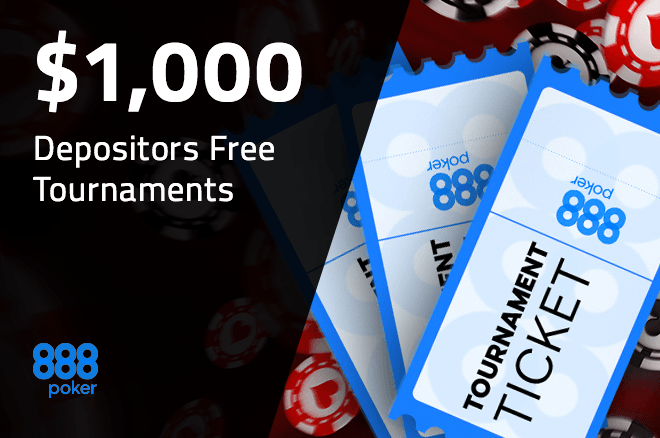 You can use them to enter some really good freerolls. 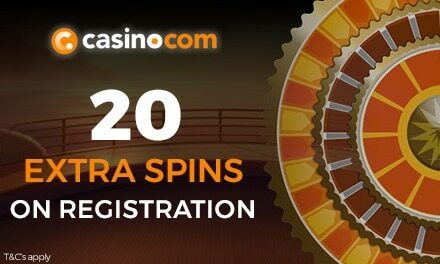 Make your first money deposit and you will get a 200% bonus up to €1,500! This bonus is automatically redeemed and increases your bankroll as you play cash games and tournaments. Every time you reach 400 Poker Points we’ll credit your Titan Poker account with €5 cash. Exclusively through YourPokerCash, you can now take advantage of 60% rakeback paid weekly to your Titan Player account. That’s right! You do not have to climb the ladder or opt-opt into rakeback Unlimited. The 60% rakeback will be automatically awarded to you, therefore, no opt-in required. Regardless of how many Titan poker points you achieve each week. As a result, you receive Titan Points based on the amount of rake you contribute in that hand. The more rake you contribute to a pot, the more Titan Points you will receive. Click here to see the full scheme. In addition to your exclusive rakeback, race fellow newbies for cash prizes every week too! As a result, you get to sharpen your poker skills and have some fun at the Beginners Races, exclusive to our Titan Poker rookies. Titan Poker Players that have signed up within the last 90 days are eligible. You must generate at least 100+ raked hands to be awarded a cash prize up to $40. While the Beginners Race runs every week! You have from Monday through Saturday to generate as many raked hands as possible. Furthermore, check out the leaderboard here. There is no better time to join Titan Poker than today. Players who generate 100 – 399 raked hands will be awarded cash prizes ranging from $1 – $6.50. Players who generate 400 or more raked hands will race against each other for up to $40 in cash prizes! Click here to see how will prizes be awarded. There are plenty of great reasons to join Titan Poker with us today and start your winning!